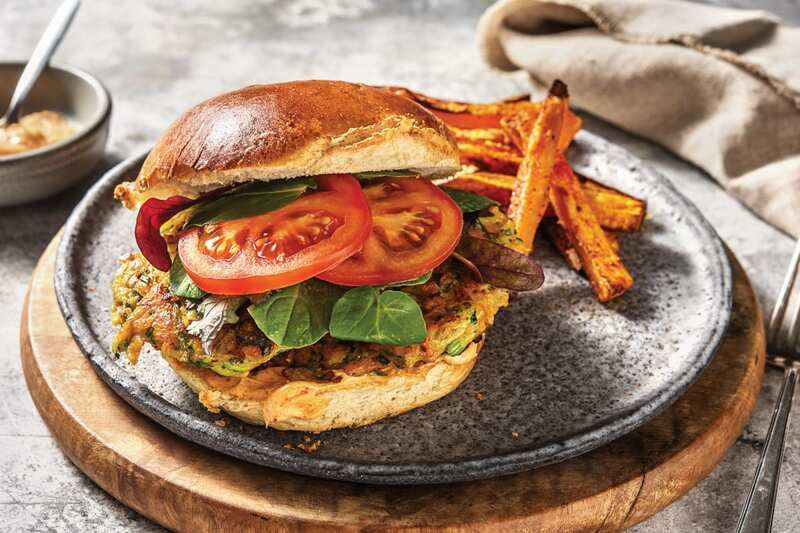 Welcome to a new world of veggie burgers. 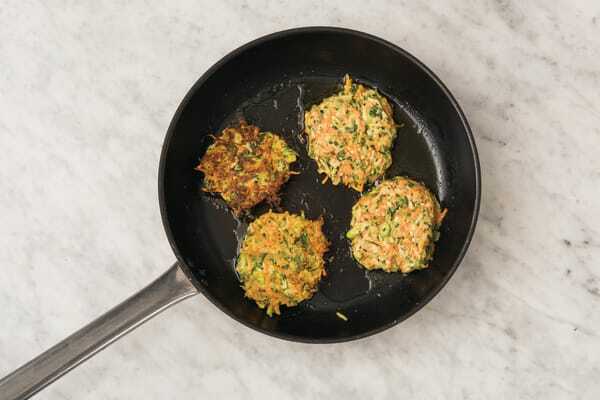 Instead of a patty, you’ll fry up a tasty fritter filled with grated veggies and Parmesan cheese, then pile it with salad on a brioche bun. 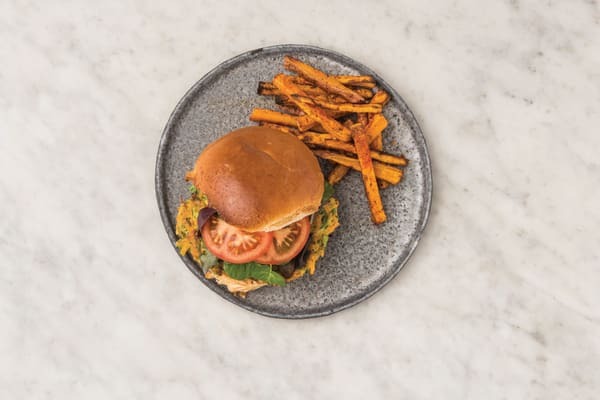 With a smear of smokey aioli and sweet potato fries on the side, this is a burger for the record books! Preheat the oven to 220°C/200°C fan-forced. 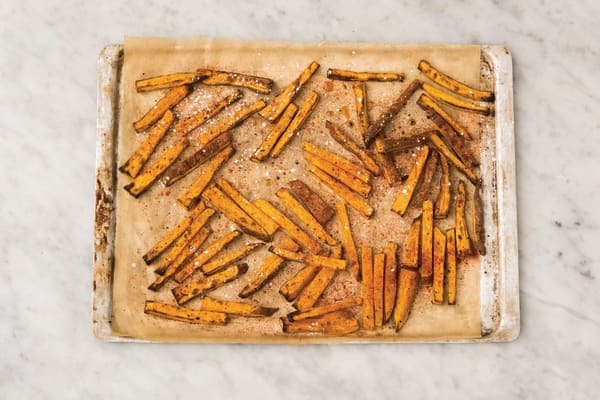 Cut the sweet potato (unpeeled) into 1cm fries and place on an oven tray lined with baking paper. Sprinkle with the paprika spice blend, drizzle with olive oil, season with a pinch of salt and pepper and toss to coat. Bake for 25-30 minutes, or until tender. TIP: Don't worry if the spices char a little, this adds to the flavour! 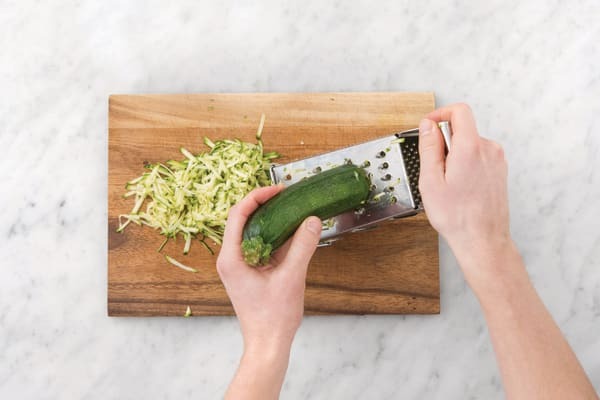 While the fries are baking, grate the zucchini and squeeze out the excess moisture. Grate the carrot (unpeeled). Finely chop the garlic (or use a garlic press). Thinly slice the spring onion. Finely chop the chives. Thinly slice the tomato. In a medium bowl, whisk the egg. 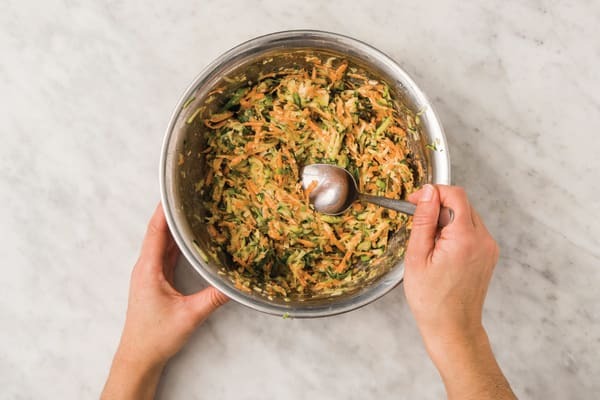 Add the zucchini, carrot, garlic, spring onion, chives, milk, grated Parmesan cheese, a pinch of chilli flakes (if using), plain flour, the salt and a pinch of pepper. Mix well to combine. TIP: Lift out some of the mixture with a spoon, if it's too wet and doesn't hold its shape, add a little more flour! 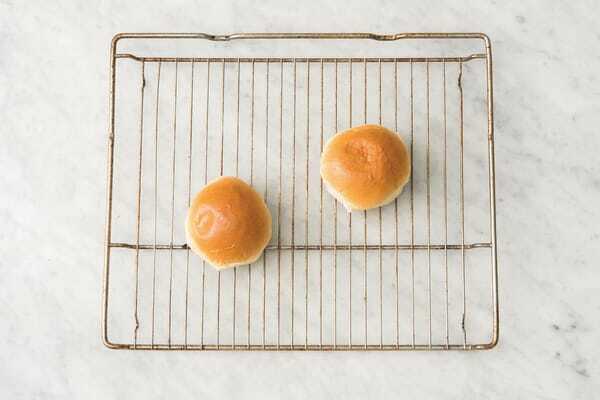 While the patties are cooking, place the bake-at-home burger buns on a wire rack in the oven for 3 minutes, or until heated through. Slice the burger buns in half and spread with smokey aioli. Top with the fritters, a handful of mixed salad leaves and sliced tomato. Serve with the sweet potato fries.